A hall is where all the activity happens. You may have a recreational hall room where you have all your gadgets, bookshelf or any other recreation of your choice or you may have a relining hall room that you can chill in after a long hard day’s work. There are several other types of hall designs as well as all people are different from one another, therefore, there are several tile designs for the hall room tailor-made to fit every situation nicely. Take your time in picking the right hall room tile design for your home after you have assessed the decor and the wall colour. It is necessary to match the floor tiles with the wall tiles as well to give a more elaborate feeling to your home. 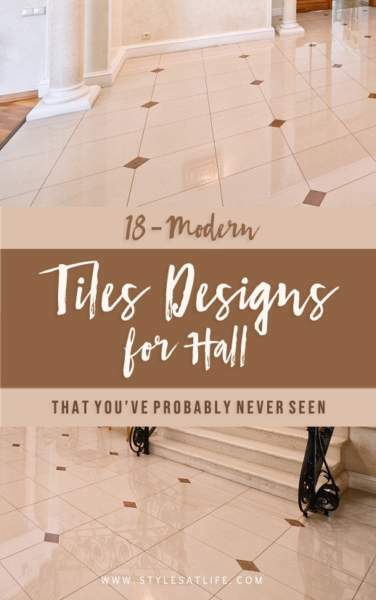 Let’s find the 18 modern tiles designs for a hall that will give you the ideas while getting tile design to your hallway. Its always better to spend a little more when it comes to accessorizing your home and this tile design is a testament to this fact. Jade tiles come in smaller designs or one big design that takes up your entire hall. If you want to go with a design that makes your hall look as elegant as possible then this is the best way to go. Pros: They are very hard tiles, which means they are stain and scratch resistant. You can also place hot items on them, making it user-friendly. Cons: Priced slightly high and is not pocket-friendly. 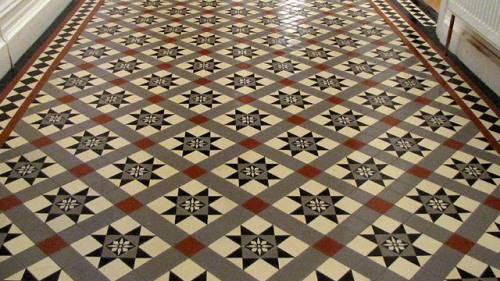 Victorian floor tiles also are a growing popularity these days and are being used by a large number of families to spice up the look of their living room or hall room. The best part is you do not have to use too many tiles and can use an exclusive number to brighten up your floor with this elegant concept. Pros: Comes in a range of variants and shades and so you have a lot of options to pick from. They last a long time and are hard wearing. They are also easy to maintain. Cons: Limited designs available and are mostly limited to checks and squares. This polished and glazed ash granite floor with black tiles is an absolute beauty when used for your hall. 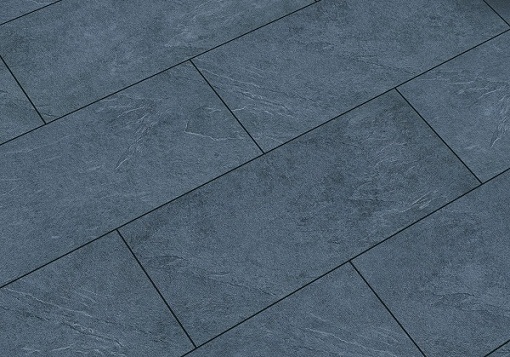 The tiles can be an exclusive number of medium sized tiles which is absolutely perfect for your hall. The shine of your floor will make this design brighten up your hall with a sheen considerably. Pros: They impart elegance and come in a wide variety of colours and designs. They are resistant to grease and stain. They are easy to maintain, in that, you can clean with soap every week and help it shines better. They are highly durable. Cons: It is not environment-friendly and is not a renewable resource. Getting a floor tile design does not always match up to your standards, therefore, a wall design is required in these situations and what better than this great matte finish design. The wall design is an absolute beauty and has the ability to match any floor tile colour and the decor of your hall as well. Pros: They impart a posh look and are picturesque. They give a rustic look and will stand the weather. They are also slip resistant. Cons: Matt finish tiles are expensive. Although it may look smooth, it is not smooth. They also impart a dull look to the area. What better than having an elegant and a classic floor tile design for your hall, and this design is a testament to the fact. The Spanish checks are naturally black and white but it can be maintained in any other colour as well. Use the best design to match your decor of your hall nicely. Pros: They are handmade and are manufactured from clay and ceramics. Hence, the tile is durable and lasts a very long time. Cons: Not pocket-friendly at all. 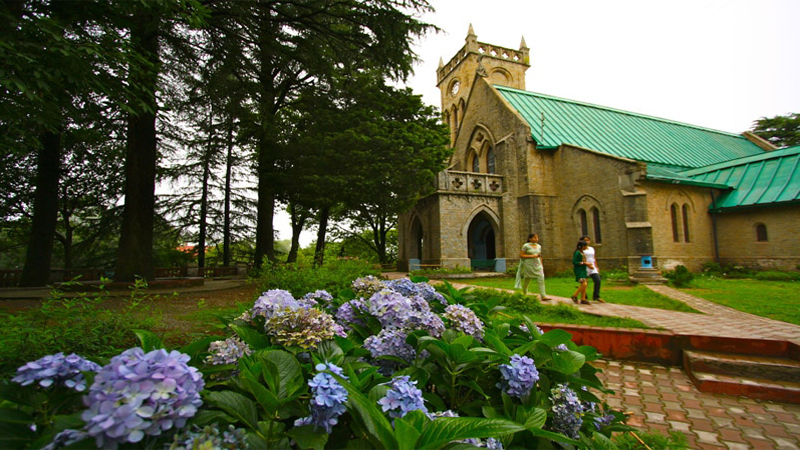 Unless you are intending to build a house that looks like a palace! Carpet tiles are bigger versions of normal hall tiles designs and this is a testament to the fact. Use this design to cover the entire of your hall room floor and create a great environment for your home. 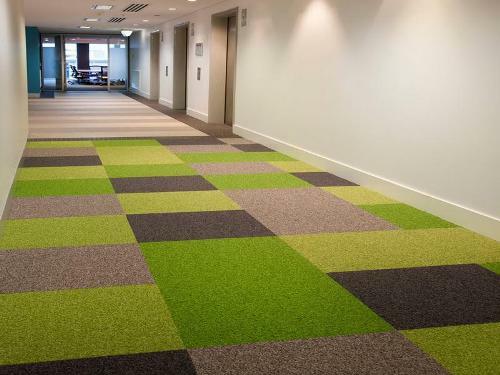 Carpet tiles come in different shapes and colours so have fun choosing the right tiles that suit your hall completely. Pros: They are durable, attractive and a flexible flooring option for you. Cons: They cannot be an option for your basement owing to its absorbent nature. Once prone to water, carpet tiles are a real mess to handle. Identifying a good carpet tile is indeed a big challenge. 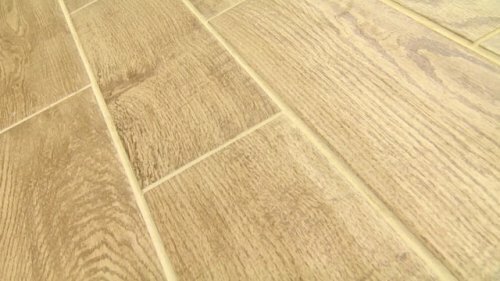 One of the most important and popular means of floor tiling today the wooden style brick layout is truly one of a kind and a magnificent layout for your home. The tiles give the illusion that the flooring of your home is layered with bricks that look like wood. Tiles do well to set illusions of grandeur in your home. Pros: They add durability and elegance to any setting. They are water resistant and offers optimal slip resistance. It is also relatively easier to clean and maintain. The interior bricks are costly than the exterior ones. Cons: They are uneven. Even with all care and effort, they are never 100% even. Bricks on the vertical surface are water resistant. 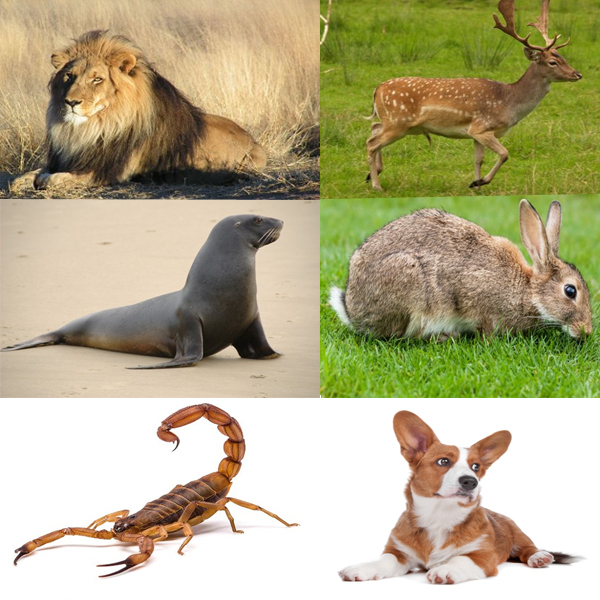 However, the ones on the horizontal cause damage. They are very heavy. Tile wood is the next big thing in hall tiling and is different from other tiles by the texture, feel and look of the tiles. Truly a great tile set for your home. 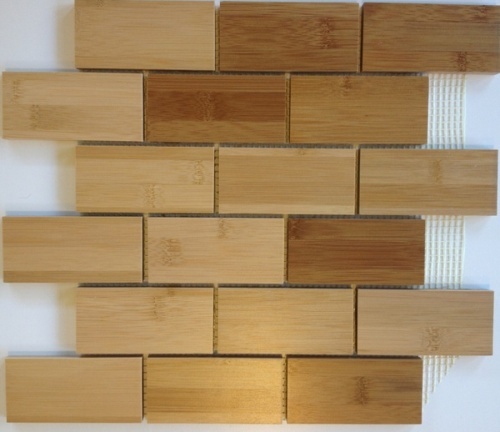 It looks like a tile that is made of wood, but it is not! It could be a porcelain or a ceramic tile. Pros: Offers first-class durability. They are easy to maintain and require very minimal cleaning. They do not expand or crack and maximally stain resistant. Cons: Priced a little on the higher side. 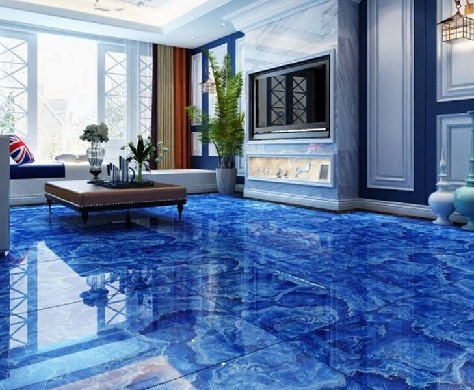 The 3-D Realistic floors are the trending revolution in designing the hallway floor tiles. The desired picture of the desired color is chosen and is ‘printed’ on the floor. These give a great finish and a really glossy look for the floor. These are also made with illusion images. The flooring is done with the normal image and then it is printed with 3-D images. Pros: They are waterproof and offer high durability. They are heat resistant and resistant to ultraviolet rays. They are slip resistant. Cons: They are costly. The size of the floor will have a bearing on the price, coupled with the design you choose. The soft tile is used to make the wall tile design for the hall room. This gives a classy look and comfy lighting for the place. The soft tiles are mostly used with colour variation and give a gorgeous elegant look. Soft tiles are used to give a matte like finish look. Pros: they offer a wide variety of themes and designs and are relatively less price. Cons: The impact of the color will have an effect on the overall appearance of the house or studio. They are usually a popular choice in studios and gyms and are tough to maintain. The floor is painted with desired colour and patterns to create an elegant look. These floor tiles designs for hallway are made with stencils and a regular pattern is created to produce a great look. This is mostly bi-colour style and is made with a glossy finish. Pros: They let you go creative to any extent and come in a range of colours and mix. Cons: At the end of the day, they are paintings on your tile, which means, they are not going to durable. Maintaining is hard. 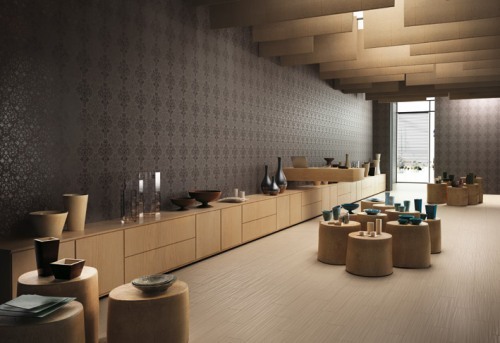 The custom wall tile designs for the hall are designed with the particular material and a specific design. 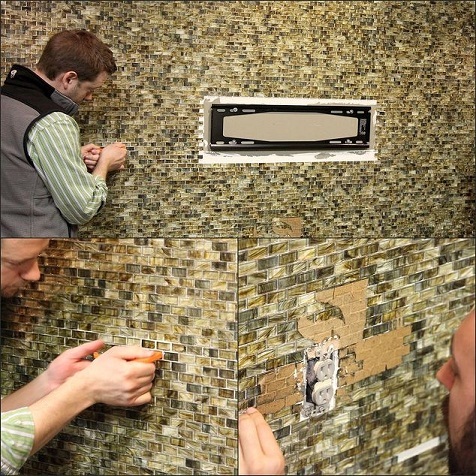 Small mosaic pieces are stuck together to form a pattern or an image depending on the theme of the room or home. Different colour mosaic stones and pieces are clubbed to get a finished image. These are also used to create an abstract painting on the wall. These are mostly preferred for contemporary and artistic themes. Pros: The custom walls are also designed with desired style and material, which means there is no limit to make it just the way you want it. Cons: Time taking and needs a lot of effort and this might have an effect on pricing. The Leather wall panel designs for hallway are used to give a luxurious look. Leather sheets with cushion are cut for the size of the wall tiles and are set on the wall. Some reflective stones are also stuck on the leather panel to give a luxurious and lustrous look. The leather panels are installed only at the Center wall to give a grand look. Pros: even with minimal maintenance, they enjoy a long life. They also help to extend the life of your walls. Cons: Leather is subjected to wear and tear. It is anti-stain-resistant. It is also sensitive to sunshine, heat and humidity. The tiles are cut to a particular geometric shape and are stuck together to form a geometric pattern. 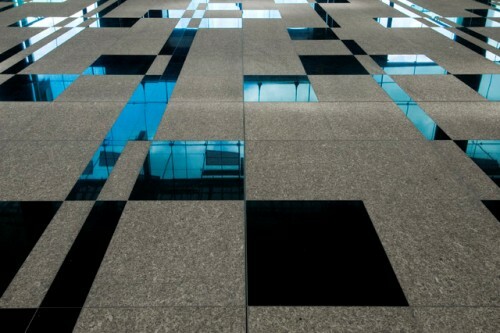 The tiles with contrast colours are chosen and are used to form a color composition. 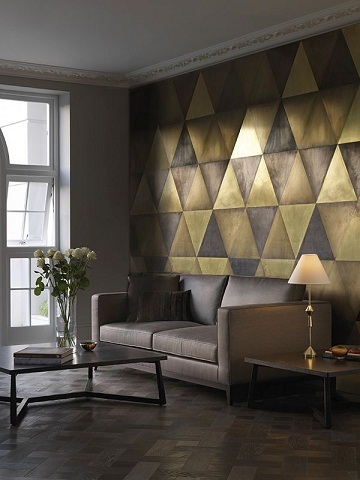 The geometric tiles wall designs for living room gives an elegant look. The walls are finished with either glossy or matte look. Pros: It is durable and offers a range of designs to choose from. The designs are eye-catchy and trendy. Cons: They are costly and tough to maintain. 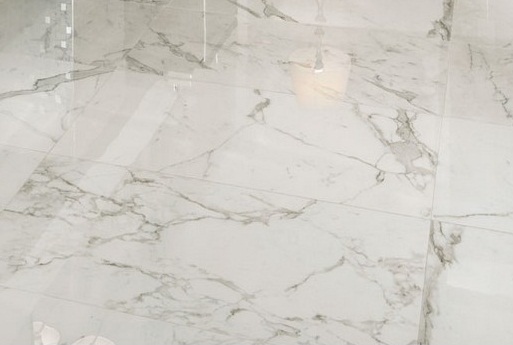 Maintenance typically depends upon the tile, whether granite or marble. 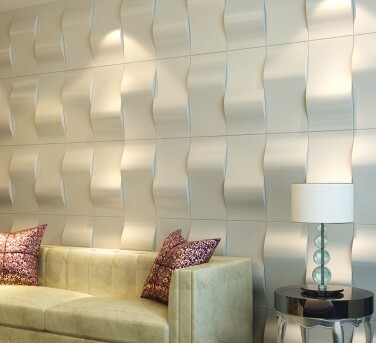 The 3-D wall panels are made with tiles to form a 3-D look. The 3-D wall tiles for living room gives a great and modern look for the home. A special pattern is chosen and the wood and tiles are made into 3-D projections and are decorated. These patterns are either used for an entire hallway or only on the centre part of the wall. Pros: They are an impressive interior looks to your living space. There is a wide range of designs to choose from. Cons: It is expensive and could be difficult to find dealers who offer unique products. Ceramic tile is usually made of sand, clay and other natural products. These ceramic tiles come in two variants, glazed and unglazed. Glazed ceramic tiles are the preferred type among the households. 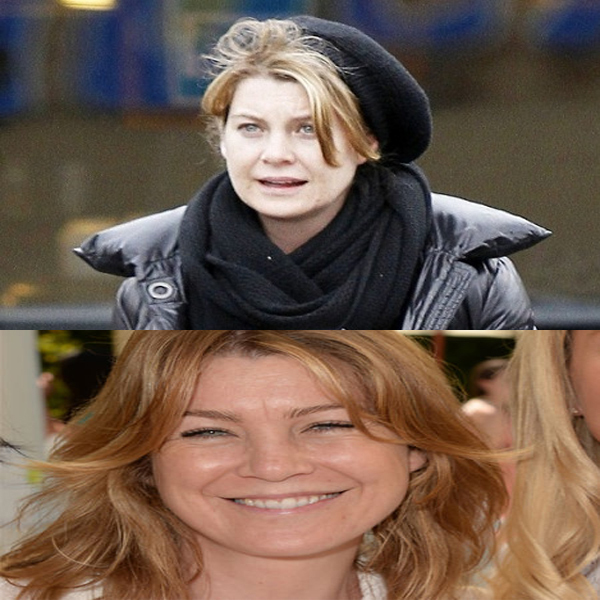 They last decades. They are known to last for 50 years or more. Choose your tile from the many ranges of designs and shades. 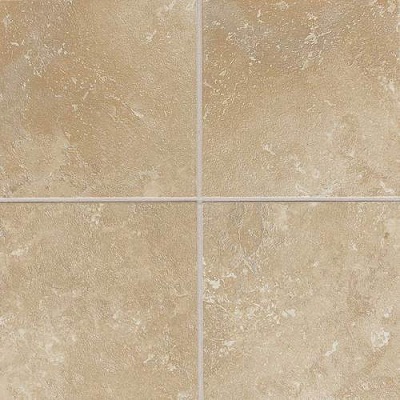 Pros: Ceramic tiles are known for their durability. Cons: Ceramic tiles offer less design flexibility. Size and colour variation of the tile can make it difficult to maintain and use. Laminate tile is a kind of flooring that is a bit price. Laminate flooring is an alternative that is considered as an option and is a synthetic flooring product, one that is combined with lamination process at the end. Laminate tiles come in many colours and come in classy colors. They are easier to maintain and always look neat. Pros: Laminate flooring is durable. They are scratch and stain resistant. They are easy to clean. Cons: Susceptible to moisture damage and is not visually appealing. Marble tiles are porous. This means it can be easily stained or scratched. Marbles, however, can be well polished. They impart a smooth look to the floor and makes it look tidy. 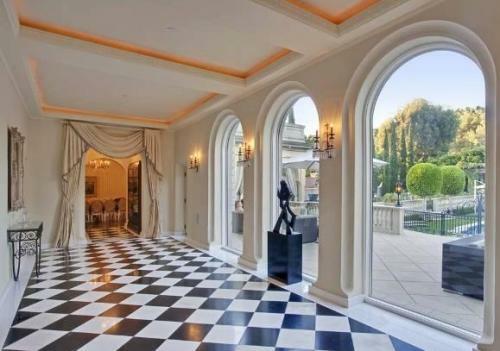 Maintaining marble tiles is cheap. You could clean it with soap and warm water. 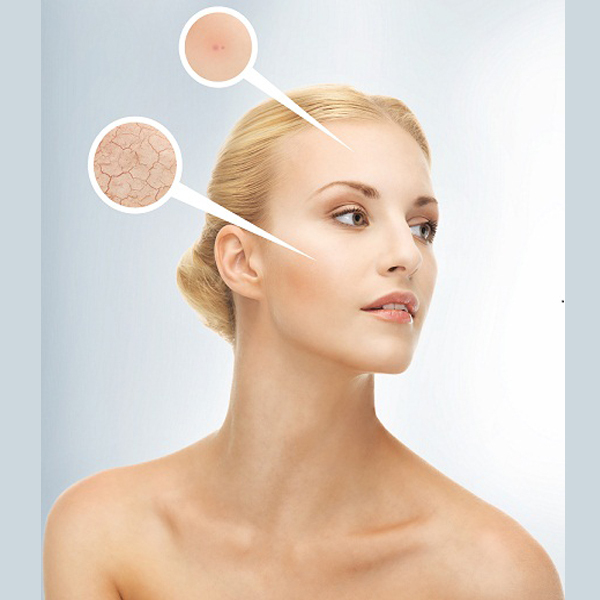 Acidic cleansers are best kept away. It is a most common and available tile in India. Pros: These good sturdy stones are durable and have a smooth texture. Provides a cool surface and is hence preferred at homes. Easy to maintain and upon regular cleaning, it will shine brighter. Cons: More prone to staining. Costly, however, less costly than granite. The hallway is the first place any person entering the home sees. The first impression should always be the best impression. The floor tiles, the wall designs impress the viewer the most. The floor type and designs are chosen according to the comfort of the user and the designs are chosen with the theme used. The wall designs also play an important role in the designing. The floor and the wall designs should be chosen as the same so that it would not create an odd look. The 3-D wall and floor are the trending technology nowadays. The entire home can also be painted with 3D-floors and walls. The stone walls are used for the modern theme home.